I asked 2K to clarify how the Deluxe Edition's loot and XP boost mods affect the game. I decided to reach out to 2K Games and clarify what the Equippable XP & Loot Drop Boost Mods actually do in Borderlands 3. I specifically asked how much of a boost they provide players, and if these editions offer the only way to obtain them. The statement I was issued below doesn't exactly answer the latter question, but the wording suggests to me the item will only be available in these more expensive versions of the game. 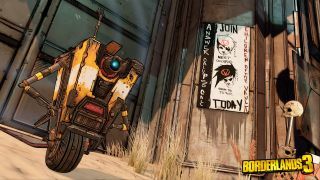 “While Borderlands 3 is not a competitive game, where boosts could lead to direct player advantages and be considered a competitive concern, we still take balance of the progression and loot systems in the game very seriously," said a 2K spokesperson. "We are still fine-tuning these systems in Borderlands 3, and the benefits the boosts in the Deluxe, Super Deluxe and Collector’s Edition will provide, but at this stage we can confirm that the Loot and XP boosts will both be level capped and tied to specific pieces of gear, similar to boosts in past Borderlands games. The intent is to give those players an initial boost, but not something that permeates the entire Borderlands 3 experience indefinitely." The boosts from past Borderlands games referenced here would be relics, like the XP-boosting Moxxi's Endowment from Borderlands 2, which could be discovered in-game. It's worth saying that preordering Borderlands 2 also provided access to the Vault Hunter's Relic, which boosted chances of finding rare loot by 5 percent. We'll have to see how it pans out in-game, of course, but the statement does seem pretty firm about the boost not affecting the entire game, just the early part. Borderlands 3 is out on September 13.